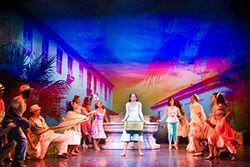 The Broadway musical “On Your Feet!” uses d3 Technologies media servers to tell the story of Gloria and Emilio Estefan, and their rise to fame. Darrel Maloney, “On Your Feet!” video and projection designer, selected the servers to project map moving scenery with retro views of Miami, Cuba and other locations key to the Estefans’ life. “I began using d3 media servers in 2011 on the tour of ‘American Idiot,’ and they’ve been my main server ever since,” including on his last Broadway musical, “Allegiance,” said Maloney. For “On Your Feet!” he deploys four d3 4U v2.5 systems from Sound Associates – two display, one master and one understudy – for a total of nine outputs. “One of the things director Jerry Mitchell wanted for this show was to move quickly from one location to another, like a movie does,” said Maloney. “Projection allowed us to do that, to propel the story forward in a really fluid way” as displays depict Gloria and Emilio’s roots in Cuba, their childhood memories in Miami, Gloria’s father’s service in Vietnam and the Estefans’ first world tour.